If a plant grows with shallow roots, the storms of a season will wither away and uproot it; like a house built on sand, a poor foundation will doom its fate. But this isn’t a book on botany, nor on architecture; foundations, good roots, are essential to thought structures as well as material structures. In theology, a bad foundation will produce results as catastrophic as bad roots or shifting sand. How we think about God and His work in the world will profoundly affect how we live and work out our Christian faith. This book evolved from the conviction that a prominent theological system rests on a fragile foundation. It is written as a small contribution towards refounding our understanding of God’s relationship with the world and our salvation on His Word. The theology in question is Arminianism; the foundation is prevenient grace. Deep within Evangelical Arminianism lies the essential doctrine that God has acted in the life of all human beings, giving them enabling grace enough to respond or reject His offer of salvation. The contention of this book is that this doctrine has no biblical grounds and is rationally unfounded and that Arminianism itself stands or falls on this doctrine. In order to establish the necessary groundwork for analyzing prevenient grace, I present in the first chapter a biblical theology and then systematic synthesis of the doctrine of total depravity. Then, after defining the doctrine of prevenient grace in Chapter 2, I consider every available argument in favour of prevenient grace, beginning with the biblical texts used to defend it in Chapter 3 and then the philosophical and theological arguments in Chapters 4 and 5. With the arguments for the doctrine considered, I then present theological, philosophical, and biblical arguments against the doctrine in Chapters 6-8. The weight of this offensive critique lies in the presentation of the case for the doctrines of unconditional election and the effectual call in Chapters 7 & 8. The intended audience for the book is undergraduate students, lay theologians, and pastors, but the argument and analysis within will make it useful to the graduate student and scholar. To make it accessible to those just entering the debate over God’s sovereignty in salvation, frequent use is made of in-text and footnote definitions for technical terms, with a glossary of all obscure terms in the appendices. Brian Shelton, author of Prevenient Grace: God’s Grace for Fallen Humanity (2014), reviewed this book for the Ashbury Journal (the article is available here). Shelton provides a critical review from an Arminian perspective, rightly observing several difficulties in the approach taken in An Investigation. However, Shelton—in the author’s opinion—misrepresents the work he is reviewing in the several places he quotes it. This author trusts that a reader can judge for himself the validity of Shelton’s criticisms. This book is a fine piece of scholarship. Rutherford presents his arguments with admirable clarity. His intention is to offer guidance for pastors and teachers who may be faced with questions about whether human beings have the freedom to accept or reject God. The great strength of Rutherford’s book is his knowledge of biblical texts and an appropriate interpretation of them. 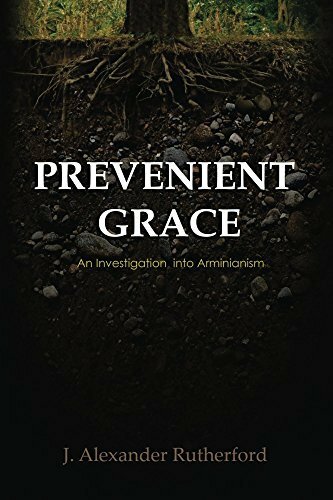 He successfully shows that the claims of Arminianism with its view that prevenient grace allows an acceptance or rejection of God are not supported by biblical texts. Nor are they justified by philosophical arguments. They layout of the book and its careful treatment of arguments both for and against prevenient grace is a model of excellent writing. His chapters are supplemented by a Glossary that explains all specific terms and Appendices where detailed theological discussions are given. Most helpful is his Index of Scripture passages discussed. I recommend this book highly as a compelling piece of scholarship.